Stonewall Gazette: Has the era of the electric car finally arrived? Has the era of the electric car finally arrived? "Unlike the vast majority of all-electric cars you read about or see at auto shows, the Fluence [pictured] is going into mass production as Renault bets that the era of the electric car, after years of false starts, has finally arrived." 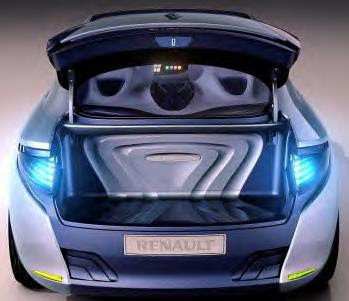 The Fluence is one of four electric Renaults that are going into production. Nissan will have its own range of electric vehicles, including the Leaf. The electric Fluence will be built in Turkey, where a near-identical car with gasoline or diesel engines is already in production, and will launch in Israel and Denmark in 2011, followed by several other European countries. Why are Israel and Denmark first? Because that’s where Better Place, a company that provides infrastructure for electric transportation, is installing a network of battery-exchange and recharging sites. When the battery on your Fluence runs low, you roll into a Better Place site, where your tapped out Fluence battery will be swapped for a fully-charged one. The process will take only three minutes and involves no grunt work. A hydraulic robot simply removes the battery from underneath the car and slots in a new one.